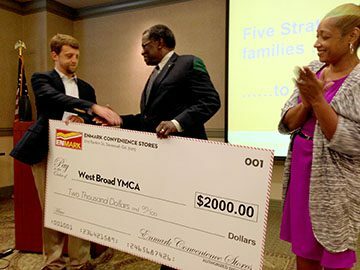 (SAVANNAH, GA) Matching proceeds raised from Peter Brodhead’s lecture, the first of five lectures in the Enmark Encourage Health Educational Series 2014, Enmark Stations raised $2,000 for West Broad Street YMCA. The nonprofit also raised funds during the Enmark Dollar Day, receiving $1 for every car wash, $1 at their charity table and $1 donations from Enmark customers. Enmark presented the check to Chiquita Hanna, Operations Director at West Broad Street YMCA at the second Enmark Encourage Health Educational Lecture on Tuesday, April 29. Enmark partnered with Healthy Savannah, the Savannah Morning News, Savannah Magazine and WJCL to present this premier series of five wellness lectures benefiting local nonprofit organizations focused on Wellness. The Encourage Health Educational Series happens on the last Tuesday of the months of February, April, June, August and October. The series features presentations from the area’s most respected experts sharing insights on nutrition, fitness and general tips for healthy living. The next Encourage Health Education Lecture will be Tuesday, June 24, with John Bennett, Executive Director of the Savannah Bicycle Campaign, detailing ’Five Ways to Make Bicycling a Healthy Part of Your Daily Life.’ Proceeds for this lecture will go to the Savannah Bicycle Campaign. PHOTO: Matt Clements, Director of Marketing for Enmark Stations presents Norm Joyner, Interim Executive Director and Chiquita Hanna, Operations Director of the West Broad Street YMCA a check for $2000 raised through the Enmark Encourage Health Education Series 2014. Founded as Interstate Stations in 1963 by Robert Demere, Enmark Stations, Inc. is a family-run business committed to offering its customers top-notch service and superior products. Today the Savannah-based company, which celebrated its 50-year anniversary in 2013, operates 59 stores in Georgia, South Carolina and North Carolina that offer high quality and competitively priced gasoline, food and beverages, cigarettes, lottery services and more. Enmark’s gasoline is filtered through a trademarked Double Filtered System, resulting in gasoline and diesel that is clean and 100-percent water-free. Enmark customers can save up to $.10 per gallon by using an Enmark Cash Card, a reloadable stored-value card that can be used directly at the pump. For more information on Enmark Stations, Inc., please call 912-236-1331 or visit www.enmarkenjoy.com .